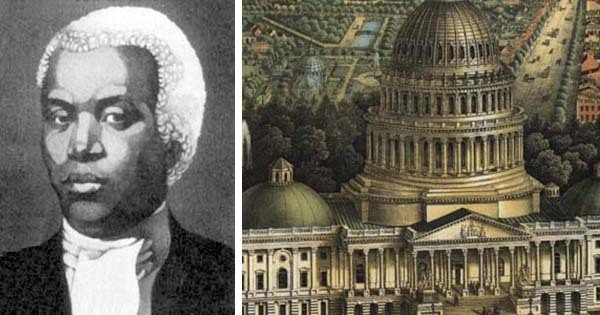 Our nation's capital would not be the same if it wasn't for Benjamin Banneker, the Black architect hired by George Washington, the first President of the United States, to design the city of Washington, DC. It was actually Thomas Jefferson himself who highly recommended that Banneker be placed on the planning committee. The former designer who walked off the job took all the plans with him, but Banneker was able to save the project by reproducing a complete layout of all the streets, parks, and major buildings. Not only was he able to do it from memory, he was able to do it in just two days! Banneker's grandmother was from England, but she immigrated to the Baltimore, Maryland area and married one of her slaves named Bannaky. Their daughter also married one of their slaves, and she gave birth to Benjamin Banneker in 1731. According to the law at the time, if the mother was free, the child, although bi-racial, would not have to become a slave. So, Banneker was able to attend an elementary school run by Quakers, a religious group that broke away from the established Church of England. He later adopted many Quaker habits and ideas, and as a young man in 1753, he was inspired to create his own clock made entirely of wood. His invention was so impressive at the time that it propelled his reputation tremendously, and until today, he is known as the inventor of "America's first clock" - which kept perfect time for forty years. His early accomplishments revealed how much of a genius he was, and helped him to later become a reputable architect, mathematician, engineer, and even astronomer. During his life, Banneker was able to use his reputation to promote social change for issues like racism, slavery and war. For nearly 10 years, he published an annual Farmer's Almanac, for which he did all the calculations himself. He once sent a copy of one of his Almanacs to Thomas Jefferson with a letter protesting that the man who declared that "all men are created equal" actually owned slaves himself. Jefferson reportedly responded favorably to his letter, but no political reform was ever taken. His Almanac, however, won him fame all over the world. Sadly, Banneker died on October 25, 1806, but his life was very inspirational. He will always be remembered for his many accomplishments, but especially his contributions to the development of the city of Washington, DC.